A Red Dead Redemption 2 PS4 Pro bundle is coming. The new bundle is set to launch when Rockstar's game releases on October 26. Read on for all the details on what the bundle includes, how much it costs, and where to pre-order, and if the console itself has any custom details. If you're after more info on Rockstar's Red Dead Redemption 2, check out our Red Dead Redemption 2 Guide. Over there you'll find all the details you need to know about the upcoming open-world cowboy game. We've got all the Red Dead Redemption 2 PS4 Pro pre-order details for you right here. We'll update the list below with more retailers as the PS4 Pro model is added to retailer sites. 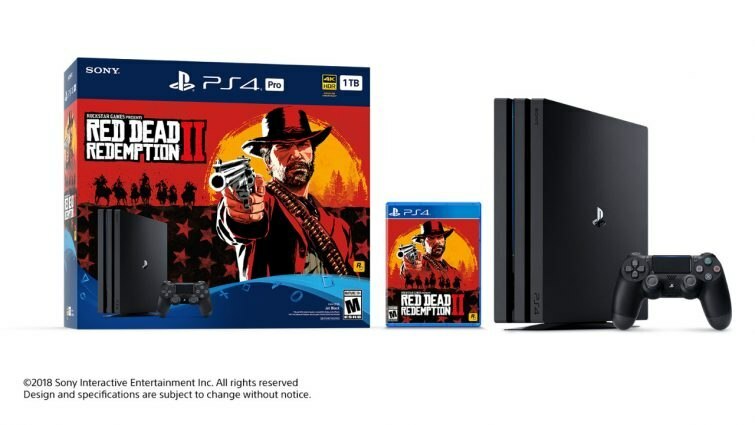 The PS4 Pro Red Dead Redemption 2 bundle will retail for $399.99 (MSRP) / $499.99 CAD (MSRP) / £TBC. The PS4 Pro is the 1TB model, and comes with one DualShock 4 controller and a copy of Red Dead Redemption 2 on Blu-ray Disc. Sadly the PS4 Pro included with the Red Dead Redemption 2 bundle is a standard black console. This isn't a limited edition system like we saw recently for Spider-Man PS4. The PS4 Pro Red Dead Redemption 2 bundle will release on October 26. That's the same day Rockstar's game goes on sale globally.